In today’s episode of The Whole Circle Podcast we break down what is in a tub of ice-cream. 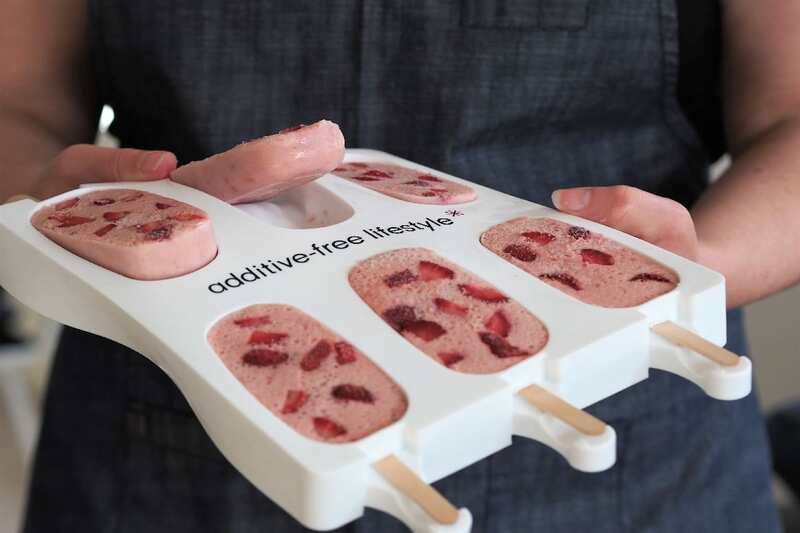 We start today’s podcast off with some very exciting news, which is, we are now stocking and selling our very own Additive-Free Lifestyle branded, reusable, silicone ice-cream moulds! Yippee! This has been in the making for over 2 years now and we are jumping out of our skin with excitement to finally be able to release them to you guys. They are so cool (yep pun intended) and look just like mini-magnums. The thing that excites us the most is, we are going to see thousands of children and adults eating additive-free ice-creams because it will now be so easy to make your own. Because we love you guys, our loyal podcast listeners, we have a special discount code for you to purchase the ice-cream moulds, so get listening to find out what that is. Today we shine the spotlight on ingredients found in commercial ice-creams and let’s just say, you may be shocked! For those of you who have been listening for a while, you will have no-doubt heard us bang on about this additive already. Head-banging. A lot of kids have reported that they feel like they have got something in their head which they need to get rid of by banging their head. If you’ve got ice-cream in your freezer, then go have a look and see if you can see Annatto or 160b listed on the ingredient panel. We implore you to avoid this additive at all costs! The good news is that there are some supermarket brands that don’t contain Annatto (160b). So have a look next time you are at the supermarket and if you can’t make your own at least consider switching to those instead. If you can find an ice-cream without Annatto 160b, that’s awesome but it’s not all you should be looking out for. You will find that emulsifiers are also in a lot of ice-creams. These are usually derived from soy and are in so many foods, not just ice-cream. You could end up eating emulsifiers multiple times a day without realising. What are they? They could literally be anything! It’s not like we go to the shop and ask, ‘can I have some flavour please?’ lol. So, what is it? We really don’t know, and the scary part is that companies don’t have to tell us either. It could be something innocent like as pure vanilla beans, but then again it could be a flavour like vanillin. Which is a synthetically derived version of vanilla. Vanillin is found in a lot of chocolate too so be wary of that. It could be Annatto (160b), which we spoke about above. It could be a form of glutamate (MSG) used as a flavour enhancer. This normally has a savoury taste, but it can often be used in a lot of sweet things as well. The point is, unless you know exactly what makes up that ‘flavour’ listing on the ingredient panel, then err on the side of caution and avoid it where you can. Just because it says natural flavours doesn’t actually mean that it is good for us. Let’s use Annatto (160b) as an example. It is technically a ‘natural’ ingredient because it comes from the seed pod of a tree. This doesn’t mean we should be consuming it (think tobacco here). You could call up the company and ask what their ‘flavour’ or ‘natural flavour’ is made up of, but the reality is they simply don’t have to tell you. They could say that it is protected under copyright and therefore they don’t have to give you that information. Also, if a product has less than 5% of a certain ingredient then they don’t have to disclose that either. For example, if vanillin has got alcohol in it and it has less than 5% alcohol in there, then they don’t have to disclose that alcohol as a separate ingredient. Yes, it could contain Guar Gum or Xanthum Gum which are wholefood options. But let’s be real, this is highly unlikely. Who really knows what Vegetable Gums are or what these are derived from, but we are fairly sure it’s not from actual vegetables. Of course, commercial ice-creams are chock full of sugar. But the good thing about making your own ice-cream is that you can control the amount of sugar you put in it. With your coloured ice-cream, the most common ingredient is artificial colours and as we know artificial colours are derived from coal tar! So gross and so not cool. You may find, let’s say with rainbow coloured ice cream, that the packaging will say no artificial colours or flavours. Some of those colours could be the colour red (120). To process that ‘natural’ red food colour they crush up bugs and in the tail of the bug is a really potent red colour which they use as the dye. So, they crush up the beetles to make the red food colouring (120). Again, they get to classify this as ‘natural’ because it comes from a natural source. This is a big one that you will find in lots of things. At the end of the day, it is a form of sugar which can cause your blood sugar levels to spike. For companies, it is really cheap to make, and it is made from corn, rice, potato starch or wheat. It is extremely processed and becomes a white powder. The purpose of it is to thicken whatever it goes into such as yoghurt, milo or ice-cream. According to a study done in 2012, maltodextrin was found to change your gut bacteria and flora and fauna in your gut health as well as messing with the probiotics in your gut. Having healthy gut bacteria keeps our immune system healthy so by constantly eating maltodextrin you increase your risk of getting sick. Check out that study here. If you are gluten free you may want to look at avoiding maltodextrin as well because it can be derived from wheat. By making your own ice-cream you can avoid all these hidden nasties and still enjoy it. With making your own ice-cream, yes, we get it, there is a bit more effort than just buying it from the store, but by making your own you know exactly what has gone into it. It’s a lot of fun and your kids will have a ball making them too. Avoiding those nasty ingredients in store-bought ice-cream may just make the world of difference to your kids over the school holidays. Every time we make our own food from scratch with ingredients we know, we are making a difference to our health and the health of our loved ones. Make sure you get in quick to get your discount on the ice-cream moulds as it will expire on 30 November 2018.